In a surprising turn of events, Slovenia beat Spain and Serbia to win the Eurobasket 2017 championship. For the country with a population of just two million people, this is by far the biggest success in their basketball history. Led by their star backcourt consisting of Goran Dragic and Luka Doncic, Slovenia managed to stay without a loss through the group stage, beating both France and Greece in a convincing manner, and then go on to beat Ukraine and Latvia in the next two rounds. Lots of good reasons to take a closer look at the team almost everyone slept on before the beginning of Eurobasket 2017. Slovenia certainly has the most interesting combination of players in their backcourt of all Eurobasket teams. 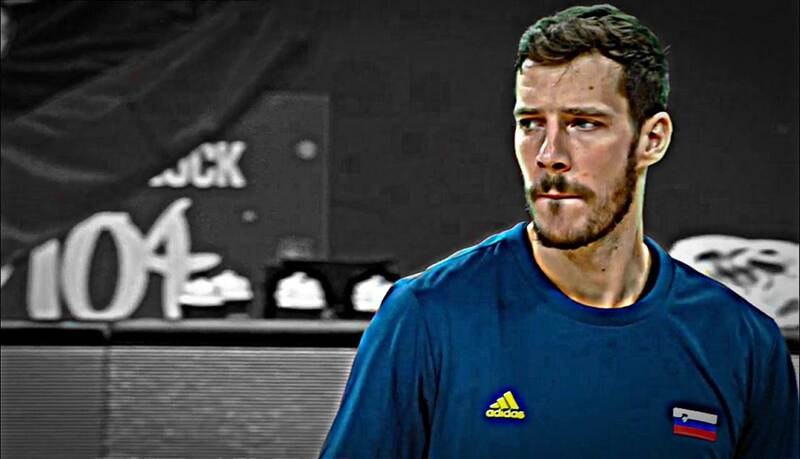 On the one hand, there is the leader, Goran Dragic. The 30-year-old playmaker will go into his 10th NBA-season this October and is clearly the life insurance for the Slovenian offense. With his unbelievable pace, he can blow by nearly any defender, as otherwise only Dennis Schröder could during this tournament. In addition to that, Dragic is capable of finishing with nice creativity around the rim, using either hand. This makes it extremely hard for tall defenders to follow him and block his attempts. In the following transition offense sequence, Dragic goes straight at the big man before using a well-timed Eurostep to create the open shot at the rim. When the defense has more players back, Dragic still has the moves and patience to create a good shot. Here he attacks the defenders again with a Eurostep, but realizes that there is too much traffic for a shot and instead throws this beautiful behind-the-back-pass for the easy Doncic-layup. This is nearly impossible to defend for anyone. In Slovenia’s halfcourt offense, Dragic excels when determining the pace of the game and then changing it very quickly. He likes to get to the basket out of the pick&roll, but also has the patience to break off some actions and reset the offense. You can rarely catch Dragic taking bad shots early in the offense or making bad decisions which lead to turnovers. So it is no surprise Slovenia is one of the best teams at Eurobasket when it comes to turnovers, committing only 11.3 per game. To demonstrate that there is no better play than his snake dribbles and hold moves out of the pick and roll. After using the screen he switches directions, which puts his defender on his back. Now Dragic has all sorts of time to operate and choose between his options. His defender is in a position where he just can’t get in front of him and has no chance to stop a possible shot. 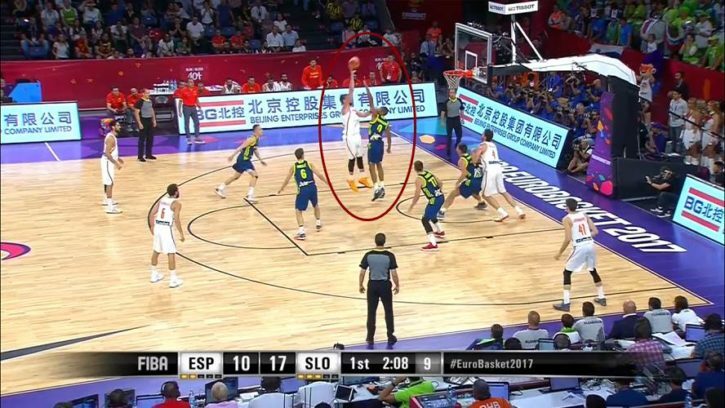 In this situation against Spain, Dragic waits until Pau Gasol commits to one player. When Gasol chooses to stay home, Dragic puts up a soft floater while leading towards the rim, so he can’t be blocked. On the other hand, there is the 18-year-old phenomenon Luka Doncic. He also played a great Eurobasket and proved that he will be one of the top picks in next year’s NBA Draft. Doncic played alongside Dragic but also had some stretches where he was the primary ballhandler on the court. He managed this very well against lots of high-quality opponents. At no point in time one got the impression that there is an 18-year-old on the field, which makes Doncic an even more intriguing prospect for NBA teams. He certainly can deliver right away on the highest level after playing more than two years in the Euroleague, ACB and now in a Eurobasket final. The question for Doncic will be how high his ceiling is compared to the talented group of players coming out of college. 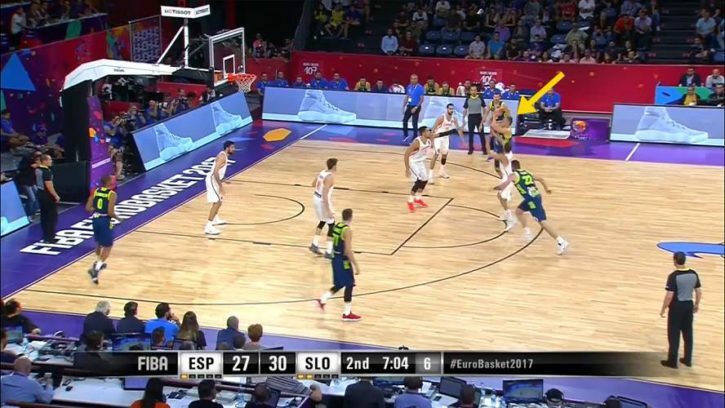 As for the Eurobasket, it can be said that Doncic had no problems keeping up with some very good European guards like Ricky Rubio, Janis Strelnieks or Nando de Colo. When looking at his playing style during the tournament, it is striking that he took a ton of three-pointers – as a whopping 61 percent of his field-goal attempts came from beyond the arc. So, it is obvious that he does not have enough confidence in his drive to the basket on this level and rather settles for contested three point shots. This worked out okay during the tournament, as he shot 31 percent from three. Still, there were some long-range-shots where it would have been better to pass the ball or simply attempt a drive to the basket. Like in this situation where he just dribbled way too much without creating an advantage. In the end, he has to take a deep step-back three with only a few seconds left on the shot clock. These are just not good shots and he had too much of them during the tournament. With that being said, Doncic also made a couple of these really wild shots. Of course, there is no guarantee that these ones will keep on going in. Apart from his preference for three point shots, his passing was the part of his game which stood out the most. 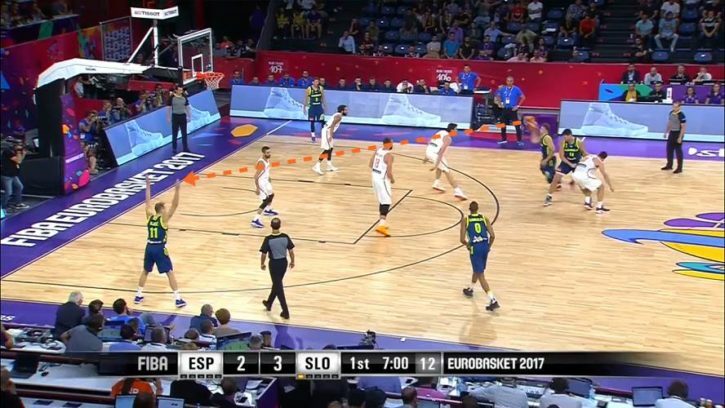 Doncic is a willing passer who can find open teammates from everywhere on the court. He also did not shy away from trying the tough pass from up top to the opposite weakside corner to find shooters. You will not find many 18-year-olds on this planet who can make this one-handed bullet-pass to the left corner while the Gasol-brothers are nearby. But also in fastbreak-situations or out of his drives to the basket, Doncic was capable of firing these passes on point. The only problem that can occur is the same as with his step-back threes: it becomes predictable after a few times. 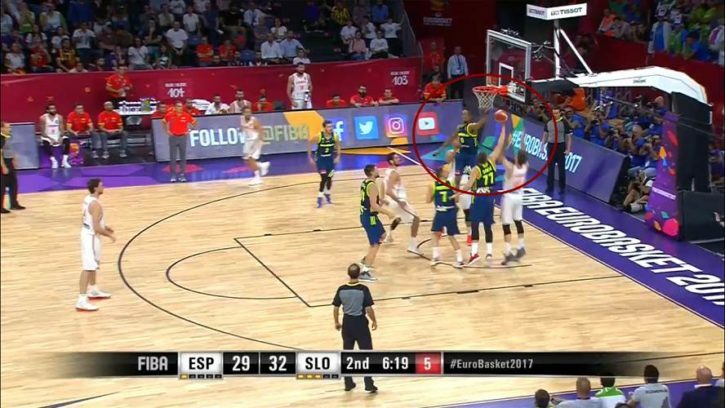 So it was no surprise that the Spanish weakside defender would watch out for that crosscourt pass and get his fingers on the ball at some time. Furthermore, Luka Doncic had some good actions out of the pick and roll. His decision making was solid as he found his teammates for easy buckets. In this case, he drives to the basket but realizes that the roll-man’s defender, Pau Gasol, is completely focused on him. He jumps, fakes the shot and then dishes the ball nicely to the big man under the basket, Ziga Dimec. Two easy points. All in all, it was a very clever decision to attack Pau Gasol in the pick and roll that night. The Spaniard is not the fastest guy on the court and had problems defending that play all tournament long. The next clip shows how Gasol just does not have the footwork to stay with the roll-man when he is coming up too high. Gasol not really commits on any side and Doncic does a nice job of patiently waiting for Gasol to do so. As the Slovenian guard realizes that Gasol is focusing just a bit on him, he immediately throws the bounce-pass to Gasper Vidmar who can finish with the dunk. Looking at the bigger picture, it can be said that Doncic took another step forward in his development with the participation at the Eurobasket. He competed with some of the best players in Europe and was on the court in very different game situations. There is no one expecting Doncic’s game to be flawless, so little mistakes or bad decisions should still be considered a part of it. In this context, his 1.3 turnovers per game look even more impressive, especially as he has been a primary ballhandler at times. 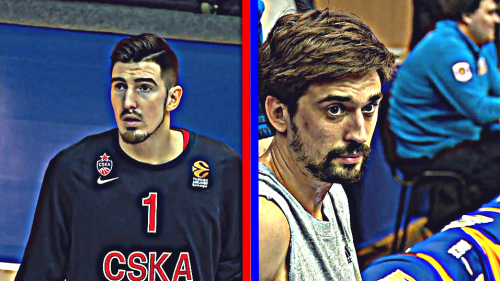 After Slovenia’s historic success on Sunday evening, the talks were all about the brilliant backcourt duo of Goran Dragic and Luka Doncic. Nevertheless, there was another Slovenian who had a huge tournament and was some kind of x-factor for the team: Big man Gasper Vidmar. He mostly delivered on the defensive end, where his toughness and physicality was much needed against numerous strong big men. Vidmar showed during these games that it is not enough to just be equally tall and strong but also to have a lot of cleverness. 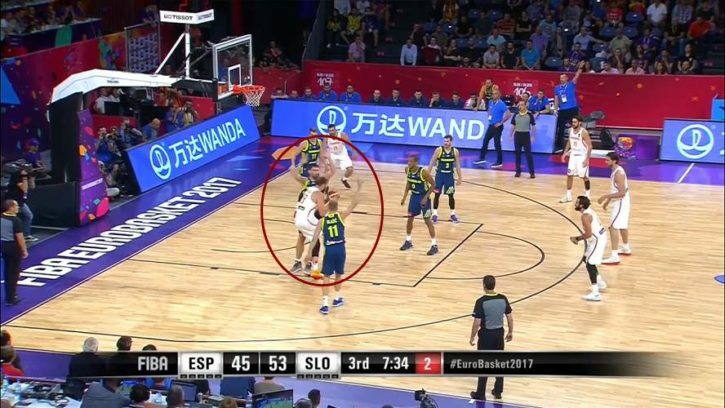 Especially in the game against Spain, the 6-foot-8 center played the kind of excellent defense versus the Gasol brothers they had not seen all tournament long. But you could not measure that defense with blocks or steals, it goes way beyond that. For example, he took on several offensive fouls in crucial moments of the game. Although being positioned under the basket for most of the time, Vidmar knew when to step out and take on the charge. 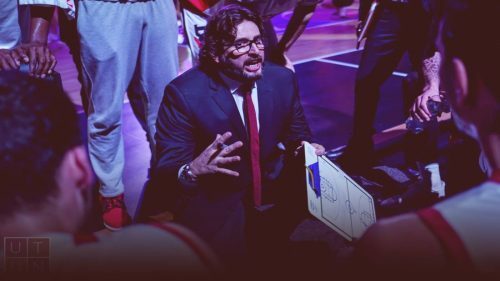 In the following situation, he just steps into the driving lane of Fernando San Emeterio and forces the referees to call an offensive foul. Not a usual action for a center who is focused on boxing out and protecting the paint. However, Vidmar went even further. In this possession, he had to switch on Ricky Rubio who is now driving to the basket. Rubio fears to be blocked and just runs straight below the hoop with Vidmar following him. After the Spanish guard could not get a shot off, he passes it back to Marc Gasol. Slovenia immediately switches back which brings Vidmar back on Gasol and Jaka Blazic on Rubio. Gasol tries to go straight to the hoop but Vidmar is just on his way back and gets in front of the big man from the Memphis Grizzlies. Vidmar sells it well and the referees call yet another offensive foul on Spain. These huge plays show what an important part of this squad Gasper Vidmar is. Additionally, Vidmar also played excellent defense in the post against some very good opponents. The Slovenian center never backs off and makes shooting around the basket very hard for every player. In the semifinals, Pau Gasol had to learn that the hard way. Gasol still scored 16 points, but just converted five of his eleven attempts from two-point-range. Vidmar just does a nice job of jumping straight up and contesting the shots with his length after not letting Pau any closer to the basket. In this case, Gasol tries a jump hook from close range but Vidmar is already there contesting the shot very well. In the next situation, it gets even harder for Gasol to score. He tries to post up again and wants to make his moves to get closer to the basket. With good footwork, Vidmar can keep up with him and forces Gasol further away from the hoop. The Spaniard now has to try a fall-away jump shot, one of the toughest shots in basketball, resulting in another miss. Another important aspect of Gasper Vidmar’s contribution to Slovenia’s success is his rebounding, where he is ranked third on his team, which seems like not a great number considering his role. But it is important to look where he grabbed these rebounds. With 2.1 offensive rebounds per game, he leads his team in this category and is also ranked in the Top15 among all players at Eurobasket. Vidmar does a good job of boxing out and uses his strong body to keep opponents away from the ball. This opened up a lot of second chance for Slovenia. 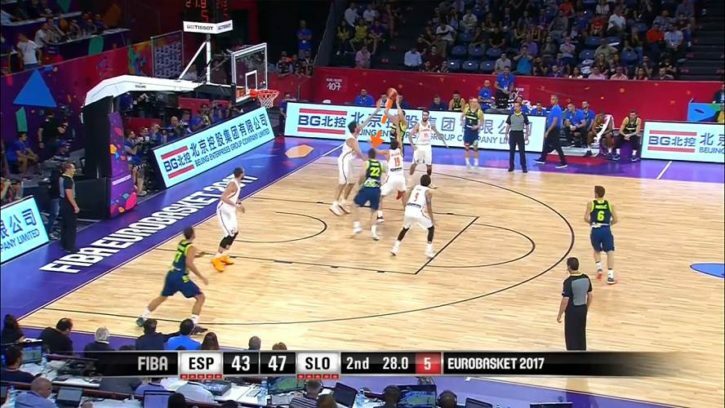 If all these plays did not make you a fan of Gasper Vidmar’s Eurobasket performance, the next ones certainly will. In important games like the one against Spain, nearly every little play or detail can be decisive. With taking on charges, Vidmar already had some of these “outside the boxscore”-plays. But he added even more to that. 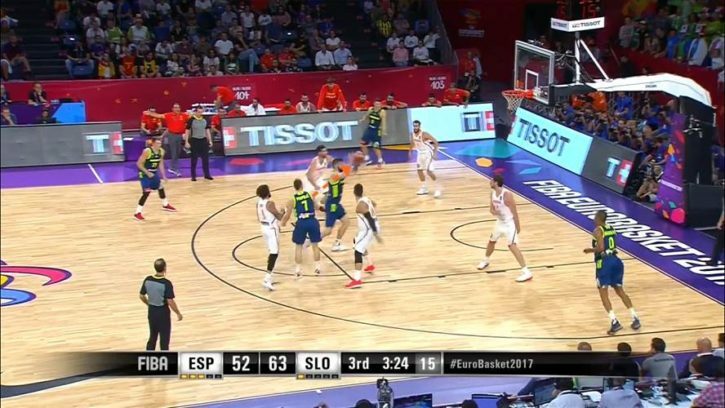 In the next possession, Spain has a good opportunity for a big-to-big-pass which would lead to a wide open dunk for Pau Gasol. His brother, Marc, immediately wants to throw that pass but did not see Vidmar coming. The Slovenian jumps straight up and just slaps the ball with both hands back in the opposite direction. This was not considered a blocked shot in the boxscore but it could very well count as one. However, the play of the day happened later, when Slovenia was already up by 19 points. Pau Gasol again tried to go 1-on-1 against Vidmar, hoping he could not keep up. 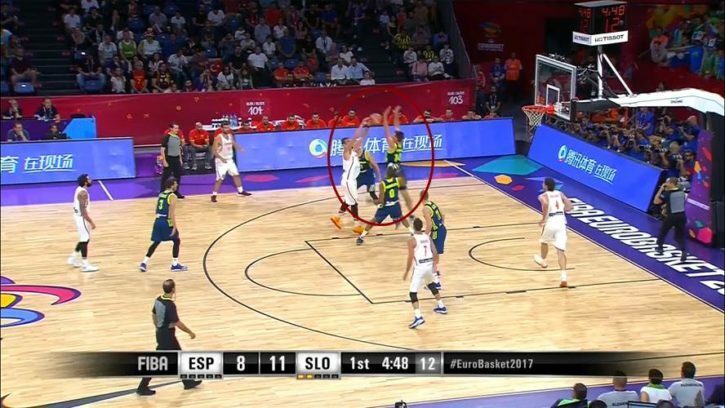 This was not the case as Vidmar waited for Pau to make his move and then just stole the ball away like it was nothing. 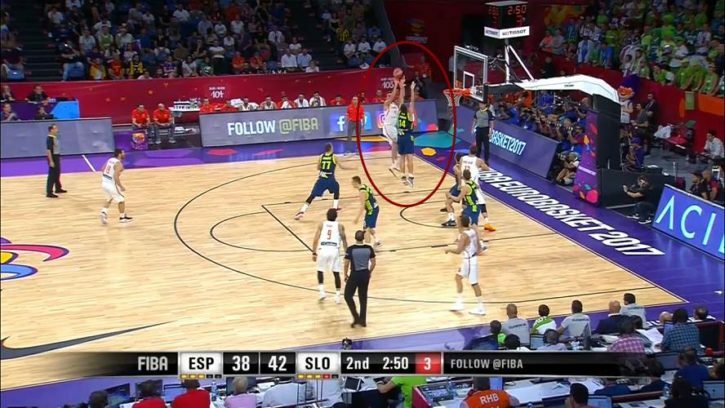 This was the moment everyone in the building knew it was Slovenia’s night, not Spain’s. 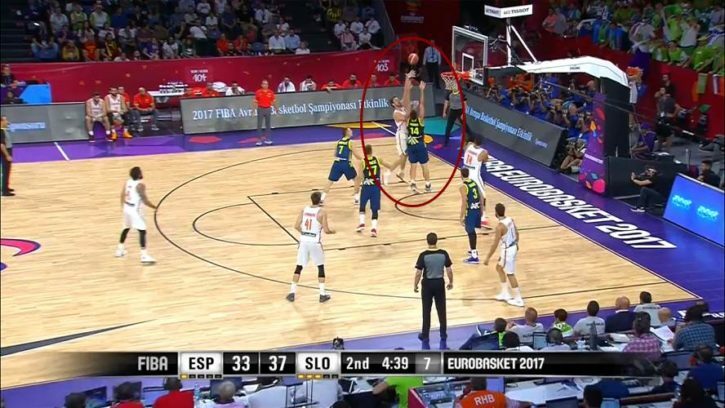 In the final against Serbia, Gasper Vidmar came up with a pretty similar big-time play, as he blocked a layup-attempt from Bogdan Bogdanovic while Slovenia was only up four with only 80 seconds to go. His stat line of that game appears absolutely not impressive with two points, five boards, two turnovers and three blocks but his team-best plus-minus of +17 shows that he is definitely the secret MVP of this tournament. A very important part of Slovenia’s offense in this context is the combination of their big men. As explained, Vidmar is focused on the work in the paint and is therefore paired with Anthony Randolph. The American can shoot the three very well and is also extremely athletic, which provides a complementary type of player under the basket. With his mobility, Randolph can defend multiple positions, which go from staying in front of smaller wings to being capable of contesting post-up shots from larger players. 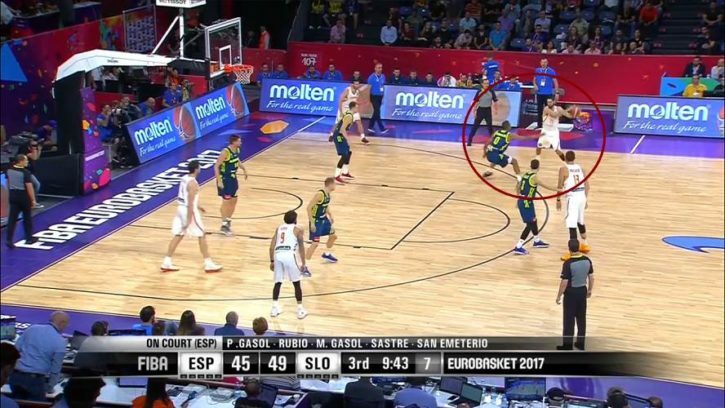 So, there was no problem for Slovenia when both Gasol brothers were on the court at the same time. Gasper Vidmar battled with one of them near the basket while Randolph can do exactly the same with the other one. In the following example, Marc Gasol tries to work his way inside against Randolph but the American native defends it very well and makes it a very tough hook shot for Gasol. Furthermore, this gives Slovenia the flexibility of not having to rely on Vidmar to be the only presence near the basket. When Vidmar has to close out to opponents on the perimeter, Randolph can step up and take over his role as it can be seen in the picture underneath. 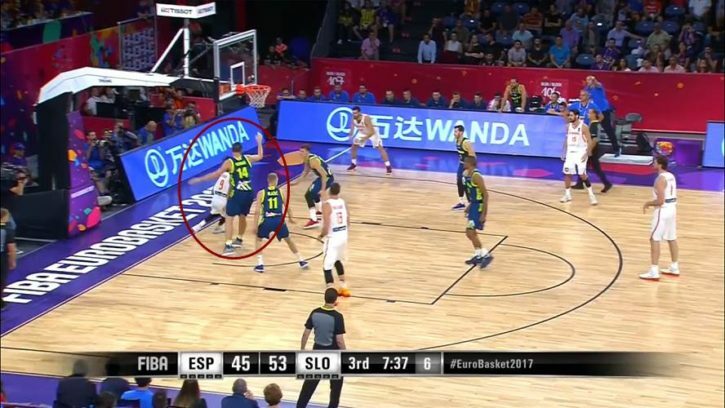 Stats show that both Vidmar and Randolph blocked a solid 1.3 shots per game which is good enough for 5th place among all players of Eurobasket 2017, trailing only Kristaps Porzingis, Artem Pustovyi and the Gasol brothers. To sum up Randolph’s defensive abilities, there is this scene from the game against Spain. 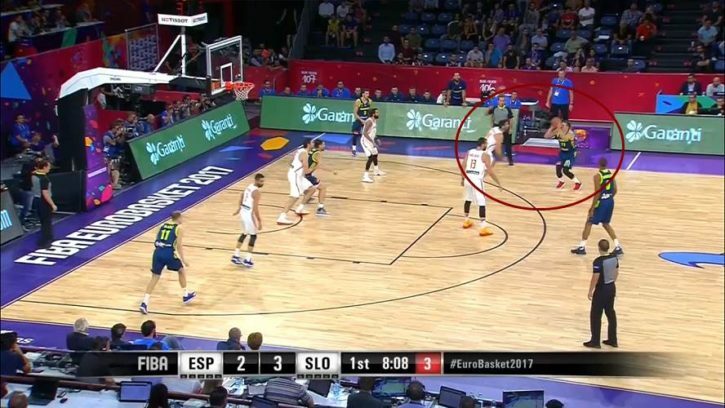 Slovenia decided to double Pau in the low-post for a short time to get the ball out of his hands. So Randolph comes over to help Vidmar against Gasol while the Spanish offense was not set yet. Gasol decides to get rid of the ball and passes it back to Rubio on top. 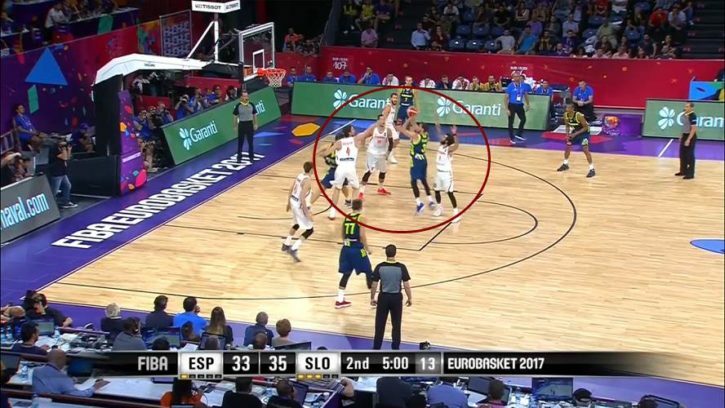 If Spain moved the ball fast, they would have an open shot, because there should be a 2-on-1-situation somewhere on the court. 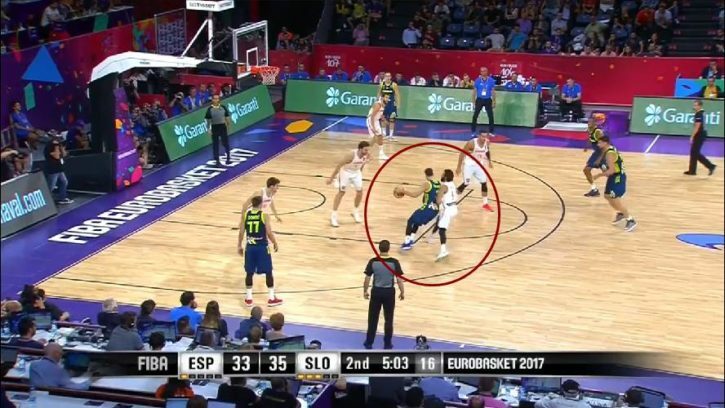 However, Randolph immediately sprints back to his man and is right in front of him when he catches the ball and Spain has to reset. On the offensive end of the floor, Randolph mainly helps with his ability to shoot the basketball and attack closeouts when big man-defenders come out too far. This can become a problem for teams with two traditional bigs who are not very fast. 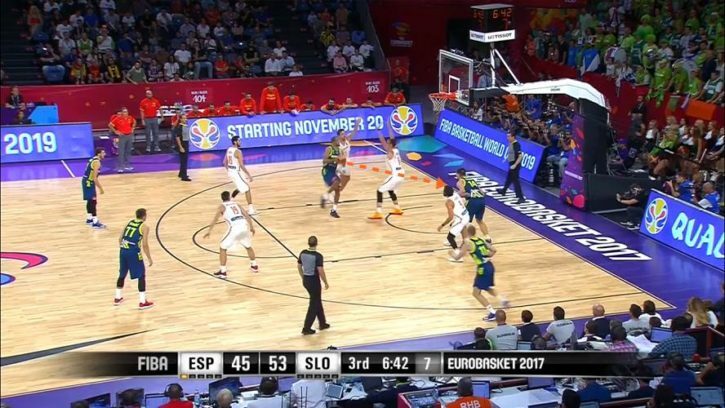 Like in the situation in the clip underneath where Spain is not set in transition defense and is slow to find their men. 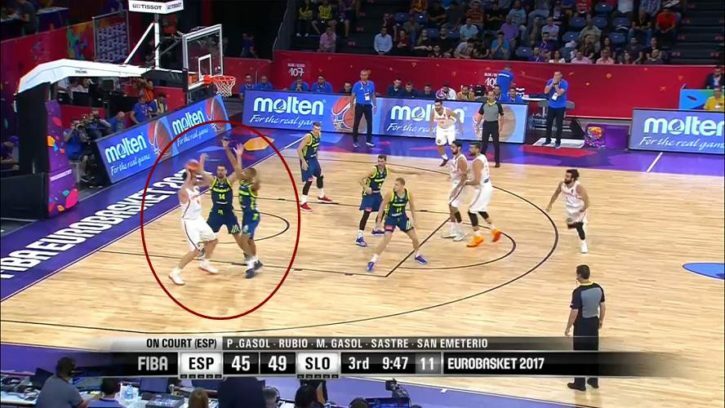 Slovenia exploits this with a simple pass to Randolph, who is wide open because the Gasol brothers are not sure which one has to defend which Slovenian big man. So when the closeout is as this lazy as in this case Randolph will knock down three-pointers as he has been doing it during the tournament at a healthy 45,5% rate. The answer to this could be closing out harder, which is tough against Randolph when you are not very quick on your feet. Again, Pau Gasol tries to defend the player from Real Madrid on the perimeter, but he uses a quick first step to blow by Pau and now force help rotations. Marc Gasol comes over, which opens the easy pass for Randolph to Vidmar as Rubio misses to also help out: another layup. So Anthony Randolph definitely adds another much-needed dimension to this Slovenian national team which lifts them on another level. He can contribute on both ends of the floor at any time, but just does not need the ball in his hands that much to have an impact. Randolph is their second-best rebounder with 5.4 per game, trailing only Luka Doncic (8.3), and adds 1.3 blocks, 1.1 steals but only 0.9 turnovers to this while shooting solid percentages from the floor (45.8% FG%). His versatility on the big man-positions can create mismatches and thereby advantages for Slovenia they exploited during the tournament. Together with Gasper Vidmar, this was a big man-duo in the right place at the right time. After talking a lot about Slovenia’s star players, it is clear that there would be no chance for them to advance to the EuroBasket final without having a nice collection of roleplayers. 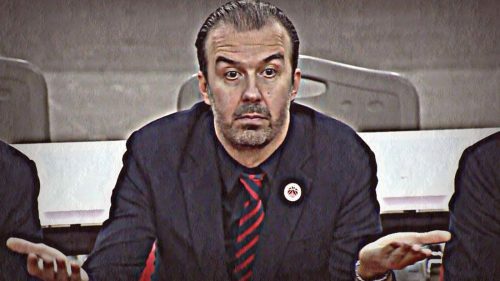 With Klemen Prepilic, Jaka Blazic, Aleksej Nikolic, Edo Muric, Vlatko Cancar or Ziga Dimec, they have exactly this group of players which possess different skillsets to contribute to their second unit success. One key to this is, of course, the shooting. With ballhandlers like Dragic and Doncic who will play more than 30 minutes per game, Slovenia needs some shooters who occasionally can hit a three. With 35.8 percent, Slovenia is ranked 9th in three-point-shooting while taking the 7th most of all teams which is okay as they also go to the line very often (#2). Additionally, it is obviously crucial for these players to know their exact roles and live up to them. This also means to create scoring opportunities for the players who are best at this. They have done a great job of doing exactly this, which led to Dragic, Doncic, and Randolph taking the most shots for the team. The group is willing to pass and find the right players at the right time. 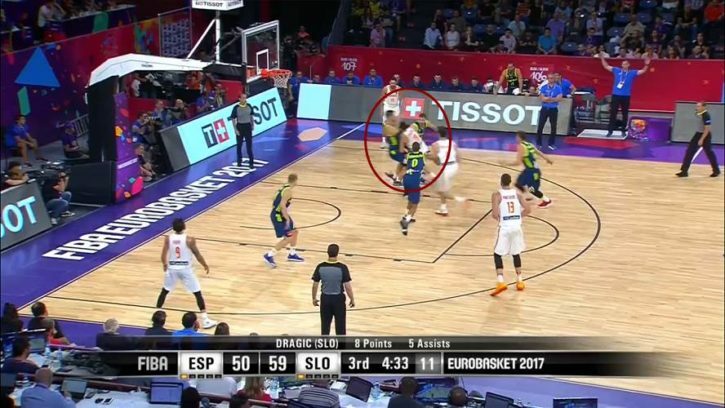 One of the possessions of the tournament in this context might be the following which began and ended with Dragic but was excellent in-between. One player who stands out of this group is Klemen Prepelic. The 24-year-old shooter is not only a threat off the ball, but can take the responsibility into his own hands and make plays. Of course he is known foremost for his shooting, even from very deep, but Prepelic is also able to run the pick&roll, pass the ball and let Dragic and Doncic take a breath. Here he runs the pick&roll with Dimec and observes his options. When Willy Hernangomez drops back, Prepelic decides to take the long jumper as he is capable of making these. This shooting ability creates some gravity and defenders tend to come out further to defend Prepelic’s shot. He uses this knowledge to create shots for his teammates as it can be seen in the next scene. Here he again runs the pick&roll, this time with Vidmar, and already goes up for the long pull-up-three. But when he realizes that the Latvian defender comes out hard to contest the shot, Prepelic throws a nice pass in mid-air to find Gasper Vidmar for the slam dunk. 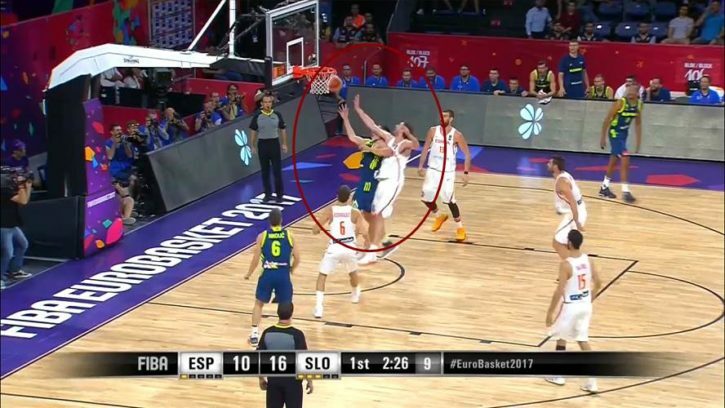 Nearly the same action here, as Hernangomez steps out to defend Prepelic after he comes around the screen. This opens up the lane for the roll-man, Dimec, and Prepelic throws another perfect pass. Easy finish. To have Klemen Prepelic as some kind of a third ballhandler is crucial for Slovenia. When Dragic sits on the bench, Prepelic can take over some responsibilities from Doncic and keep the Slovenian offense on track. This versatility makes it hard for any defense to concentrate on specific players and makes Slovenia unpredictable. But when Dragic or Doncic take over, Prepelic can simply take on the role as an off-ball shooter. His 42.5 percent from three-point range is the second-best mark for any player with 40 attempts or more, trailing only Italy’s sharpshooter Marco Bellinelli. With the championship at Eurobasket 2017 in Istanbul, Slovenia achieved the biggest success in their basketball history. 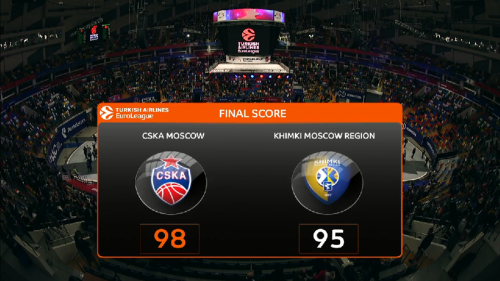 The unique combination of experienced players and young prospects worked very well under the system of headcoach Igor Kokoskov. They found the right puzzle pieces to support their stars and created a very versatile and modern basketball team. It feels like every player of this team somehow contributed to their success and made this Eurobasket 2017 one to remember for their fans and every basketball-enthusiast.